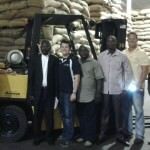 WASHINGTON, Aug. 1, 2013 /PRNewswire/ — The World Cocoa Foundation (WCF) has welcomed the arrival in the United States of four cocoa storage and warehousing experts from West Africa. The visit, made possible by the Cochran Fellowship Program – Global Cocoa Initiative, marks the first in a three-year series of courses organized by WCF for professionals from cocoa producing countries. The program, which strengthens ties between professionals in cocoa producing countries and American companies and research institutions, is funded by WCF and the U.S. Department of Agriculture-Foreign Agricultural Service (USDA/FAS). The Fellows are Dele Adeniyi, research officer at Nigeria’s Cocoa Research Institute; Kafumba Kenneth, warehouse manager at Liberia’s Produce Marketing Corporation; Emmanuel Quansah, lecturer at Ghana’s Kwame Nkrumah University of Science and Technology; and Eric Olivier Tienebo, teacher and research assistant at Cote d’Ivoire’s Houphouet-Boigny National Polytechnic Institute. 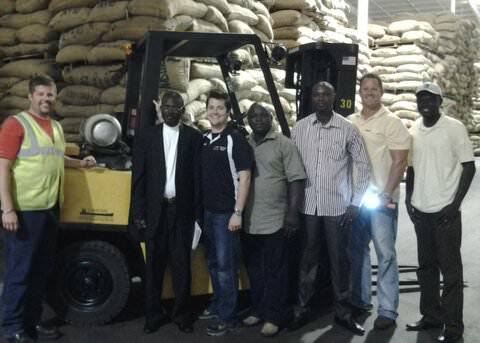 The Fellows will visit WCF member company facilities to explore warehouse management and storage issues, including Camden International Commodities Terminal (New Jersey) and Dependable Distribution Services (New Jersey). They will also visit Mars Chocolate North America (Pennsylvania) and Archer Daniels Midland Company (Pennsylvania) to learn about cocoa processing and chocolate manufacturing. They will then meet with WCF members involved in cocoa trading and supply chain management in New York, including Atlantic (USA), Inc. (Ecom-Agroindustrial), Olam Americas, Inc., and Armajaro Trading Inc., to discuss the global cocoa trade. The USDA/FAS Cochran Fellowship Program provides participants with high-quality training to improve their local agricultural systems and strengthen and enhance trade links with the United States. Participants are mid- and senior-level professionals from both the public and private sectors who are concerned with agricultural trade, agribusiness development, management, policy, and marketing. Since its start in 1984, the Cochran Fellowship Program has provided training for more than 14,300 participants from 123 countries.